Where do you go when there's no place left to go? If you've been everywhere and done everything and aren't satisfied, come discover the mysteries of Cottonwood Place Bed and Breakfast Inn and the captivating American Southwest. 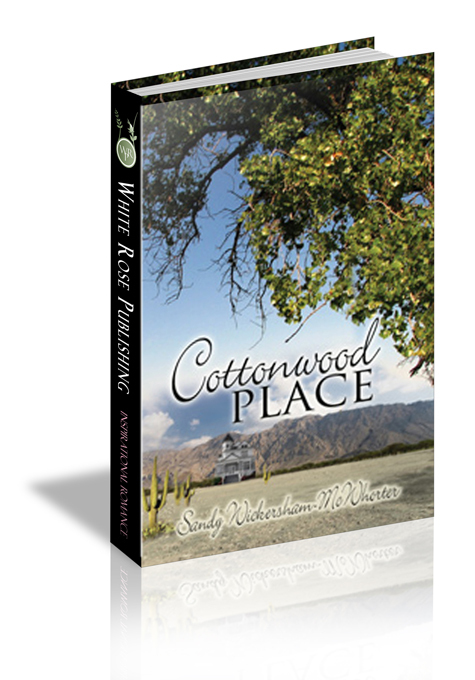 Cottonwood Place Brochure Megan MacCloud knows before meeting him that Ian Hunter is the neediest of the many troubled guests her inn has helped. Estranged from God, neither she nor Ian believe that He can bring them the harmony and love they crave. Ian says he couldn't resist driving across the country to her after her face on a brochure "hypnotized" him. Because of past abuse, her attraction to him is dashed when she learns he drinks. She resists loving Ian, but her family and almost-human pets frustratingly bond with him immediately, proving he's good. Megan, her Grandma, and pets resolve to help Ian stop drinking and be a doctor again. He helps solve major problems with guests and saves several lives as Megan and her mysterious, Navajo-and-White family show him religious and lifestyle philosophies that are foreign to him, yet truly American. When Megan's kidnapped by a guest for unknown reasons, Grandma says that to find Megan and have the life with her that he dreamed of, Ian must first "find himself." What does that mean? Can God use Megan's family, their Navajo ceremonies, and the police to find Megan and help her and Ian "walk in beauty" before she's lost forever? “Pardon me, sir?” Megan laughed to herself. “You are observant and beautiful,” Ian murmured, feeling stupid.